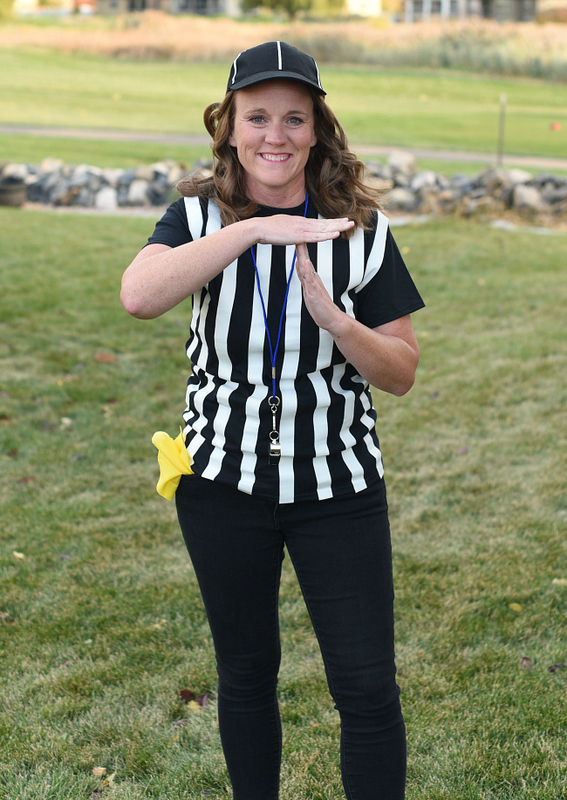 A Peek at the Fun: Whether you are wanting to throw a football birthday party for your kid or you’re having a party for the big game, these easy football party ideas are perfect for the big day! We’ve both got a couple of little boys who are obsessed with football. They wear football jerseys to school every day, play it at recess and snuggle their footballs at night. Neither of them can seem to get enough football. 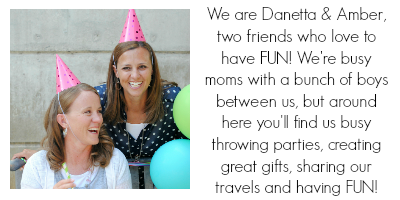 So when one of their birthdays rolls around, we know exactly what kind of birthday party to throw! Football everything! 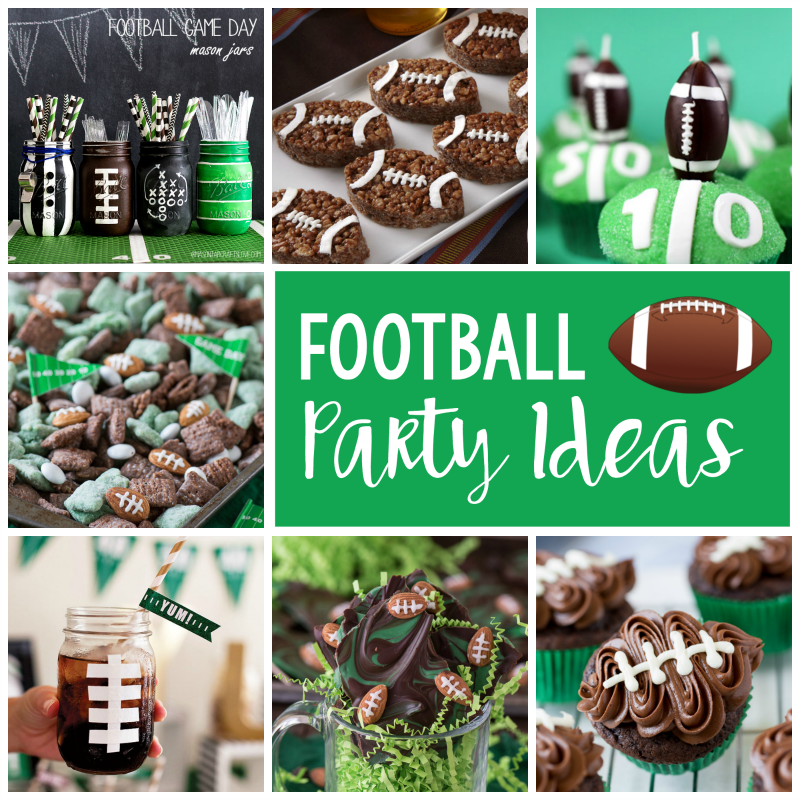 These fun football party ideas could be used for a kids football birthday party or for a big game party or really just any football party you want to throw! 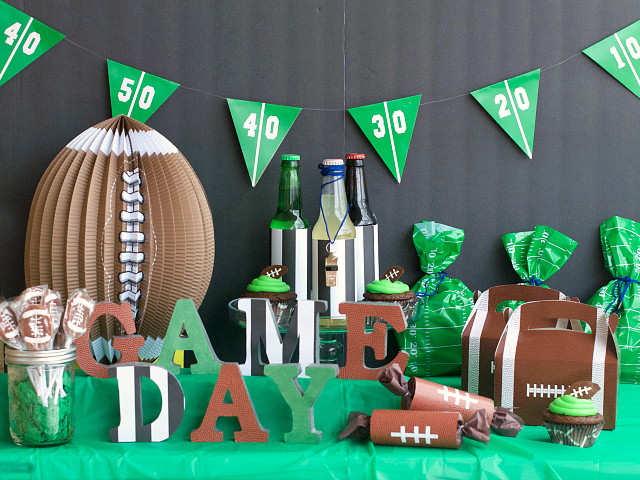 Whether you love football or not, you’ve got to admit that this football party looks fun to throw! And if you’ve got little ones that love it like ours, this football birthday party is perfect for them. 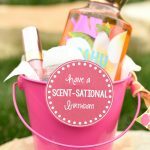 We had a ton of fun pulling together all of these fun, easy football birthday party ideas-from decorations to invitations, treats to party favors, if you want to throw a football party, we’ve got you covered! Who doesn’t get excited for football looking at that fun party?! 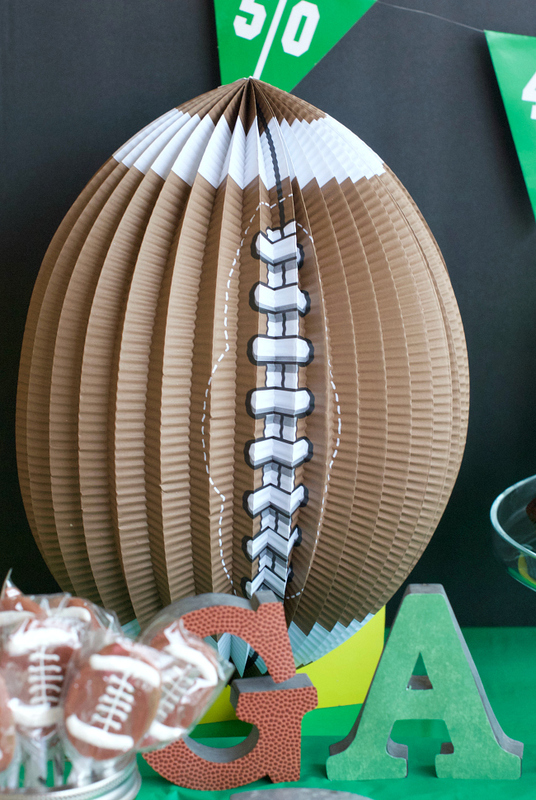 These football party invitations might be our favorite part of this party! They are made to look like football tickets but with all the party info printed right on them. How fun is that? 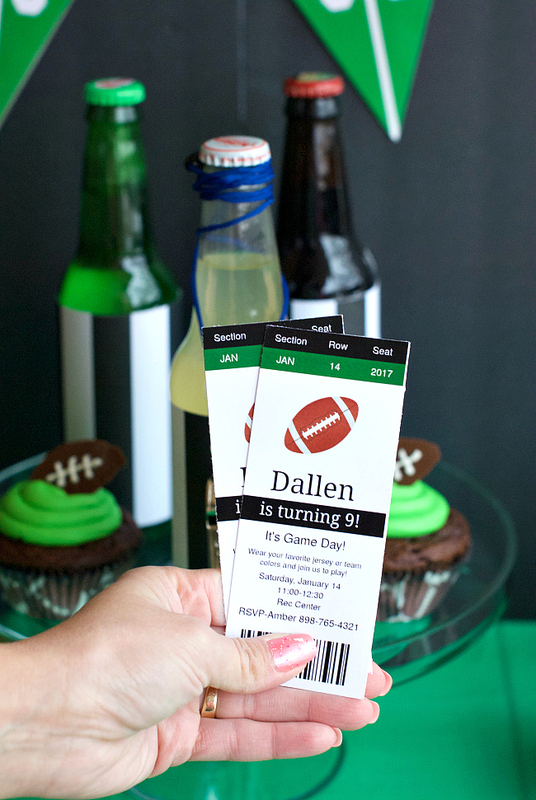 Here’s a football themed party invitation template that you can use and customize for your own party. To use this football invitation, right click and save it to your computer. Then, open in a photo editing program (like PicMonkey) and add your own text. Need help with how to do that? We’ve got a tutorial here. Hopefully, that was easy for you! 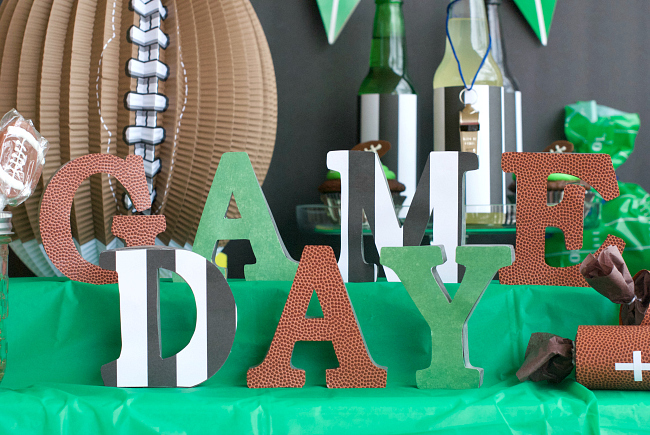 There are lots of easy and fun ways to decorate for a football themed birthday party. We used black foam board for a backdrop and added little green pennant flags. Then we added some fun touches. 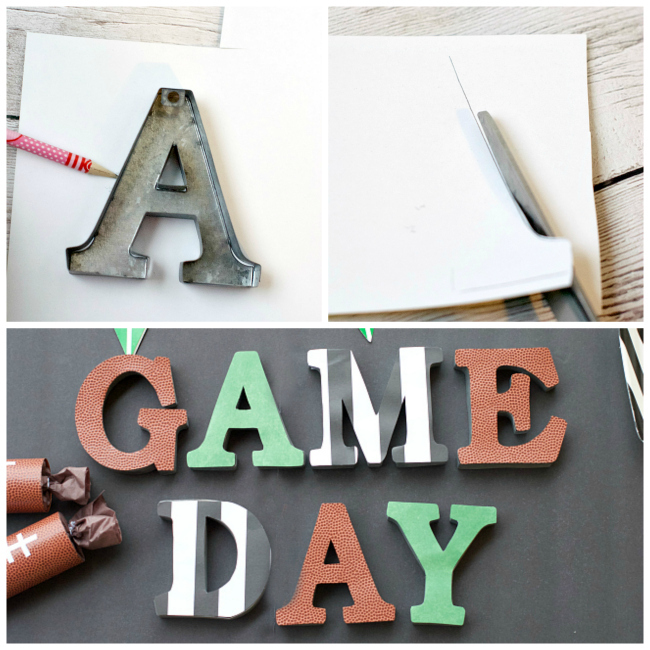 Our favorite are these letters spelling out Game Day! And they’re easy to make! You’ve got to have some fun treats at a football party right? 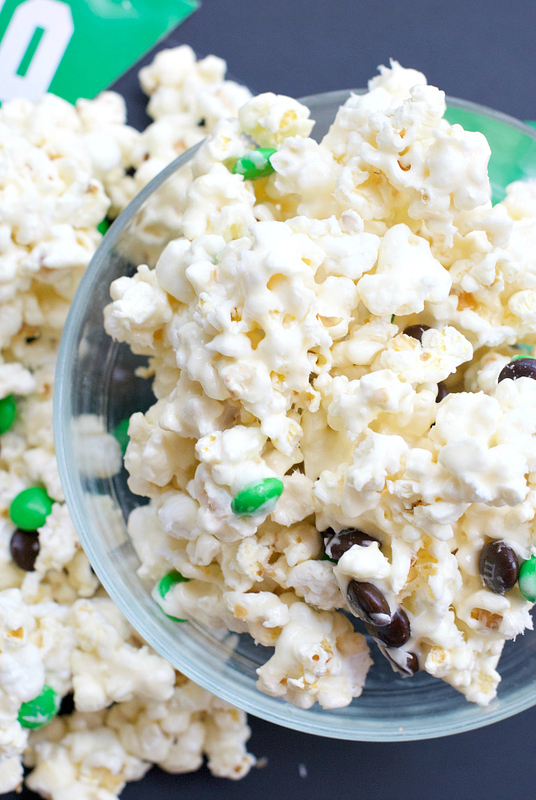 We made a fun Game Day popcorn to celebrate the big game. Super easy and tastes amazing! Bet you can’t stop eating it. Cook your popcorn. Try to remove as many unpopped kernels as possible. Set this aside in a large bowl. On the stove in a small pan, mix your Karo syrup, sugar, butter and vanilla over medium-high heat until it boils. Boil for 1 and a half minutes. Stir in the marshmallow fluff until totally melted. Pour this over your popcorn and mix and mix until it’s all coated. Let it cool for 3-5 minutes, then add the marshmallows and mix them in. 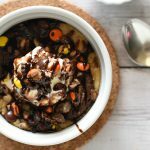 Top with M&Ms. Let it sit for a couple of hours before eating for best results! Cupcakes are a must for most fun parties for us. What makes these special are the simple little chocolate footballs on top for our football birthday party so that they birthday kid had something fun to put candles on. Heat up your melting chocolate (the brown first). Once it’s totally melted, pour it into your sandwich baggie and snip off just the very tip of the bag (just a tiny bit). On your Silpat mat or wax paper, pipe the shape of a football and fill it in. As it begins to set up you can smooth it out a little with the tip of your baggie. Once it is hardened, peel it off your Silpat mat and flip it over. Then heat your white chocolate, put it in a baggie and pipe the stripes. Ours were VERY not perfect but still looked cute. Then just make cupcakes and pipe frosting on and add your little footballs! 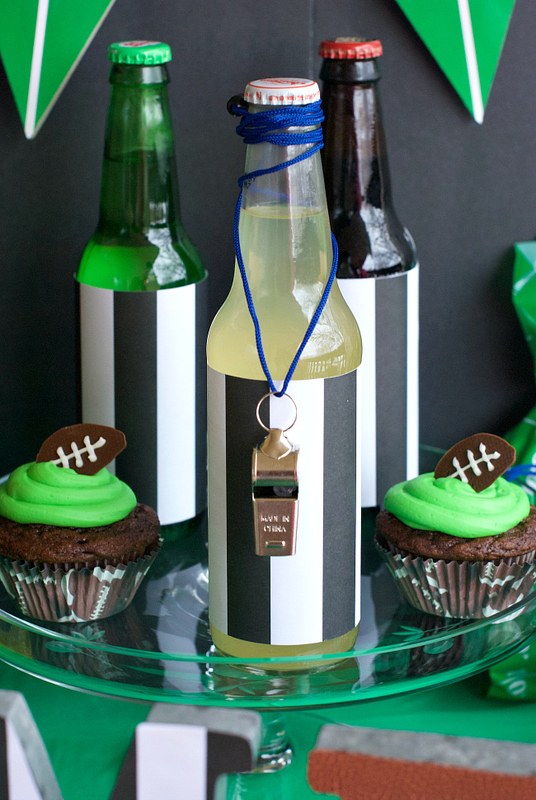 Another fun idea for your football themed party is to make your drinks cute! We simply used our scrapbook paper to create drink wrappers. Then we wrapped a whistle around the top of the bottle. We also have drink wrappers that you can print and use here. So simple but such a nice football party touch! 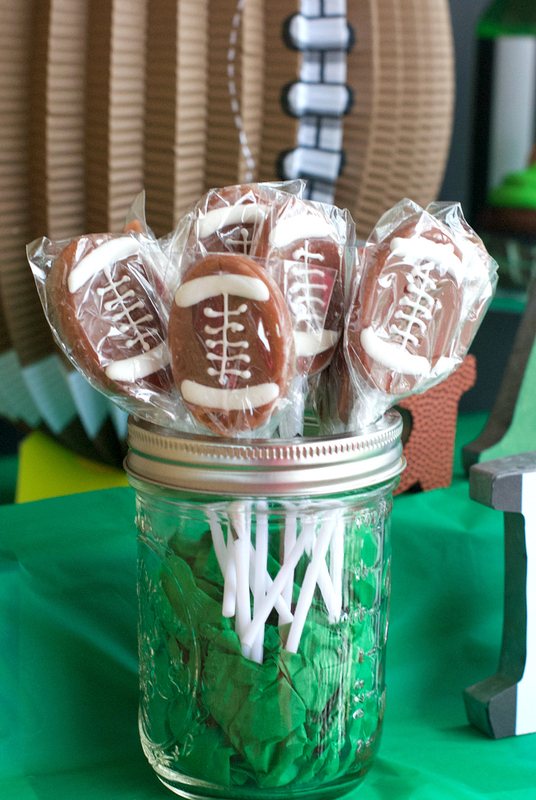 Want to have some fun football themed party favors for the guests? 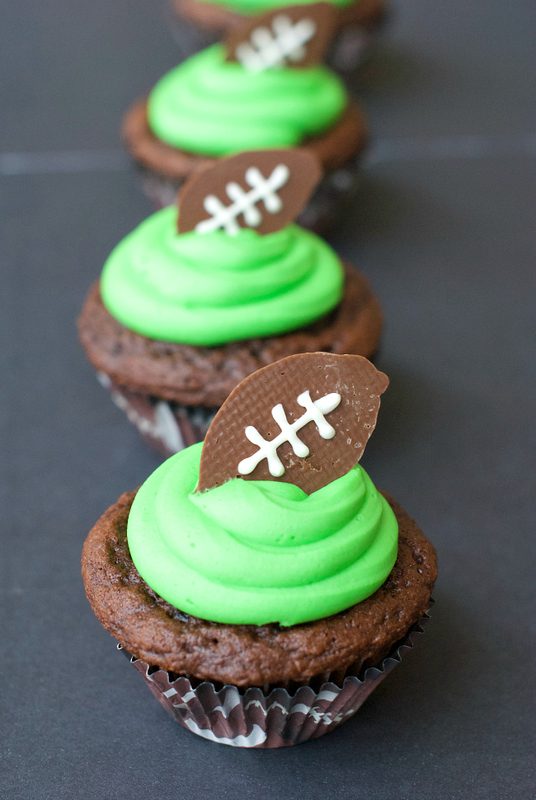 We’ve got several fun football party favor ideas-use one or use them all! 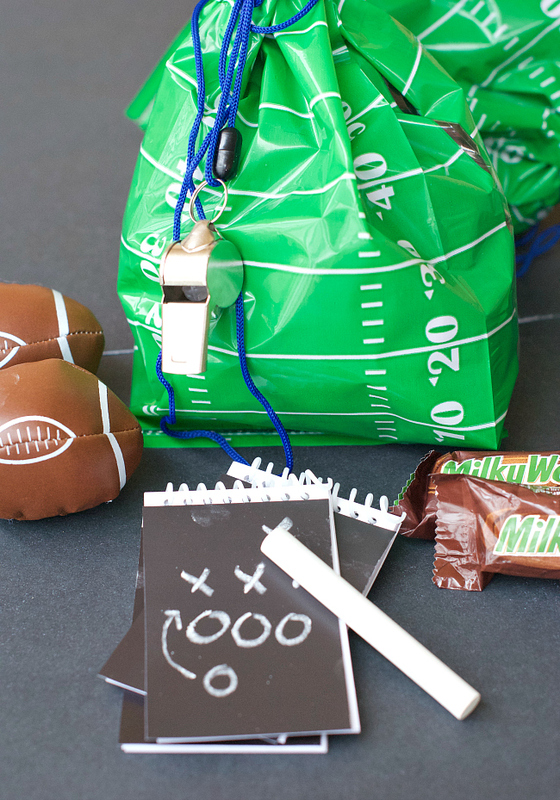 We got these cute football bags from Oriental Trading and filled them with some fun things, then tied them with a whistle! Inside we put candy, mini footballs and little notebooks and chalk. 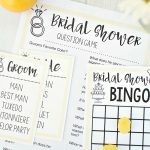 We used Silhouette chalkboard vinyl on tiny little notebooks to make them playbooks. 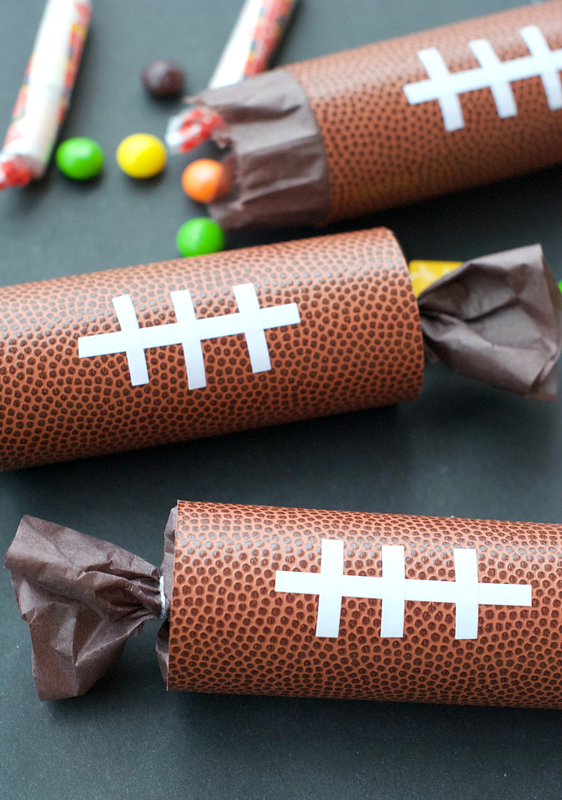 We also made these cute football party poppers! Love these! Aren’t they cute? To make these, cut a piece of tissue paper so that is about 2 inches wider than the toilet paper roll and big enough to wrap around the toilet paper roll about twice. Roll it around and tie one end with string. Fill it with candy and then tie off the other end. Cut your scrapbook paper to exactly the width of your toilet paper roll and just enough to wrap around it just more than once. Roll it around and tape it. Cut your white sticker paper to make the stripes and put them in place and you’re set! You can also get these cute football favor boxes from Oriental Trading. 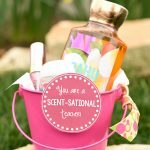 Fill them with favors or fill them with food, either way, they’re fun! We also found these fun football suckers at Zurchers and used them as favors (plus they looked cute on the table). 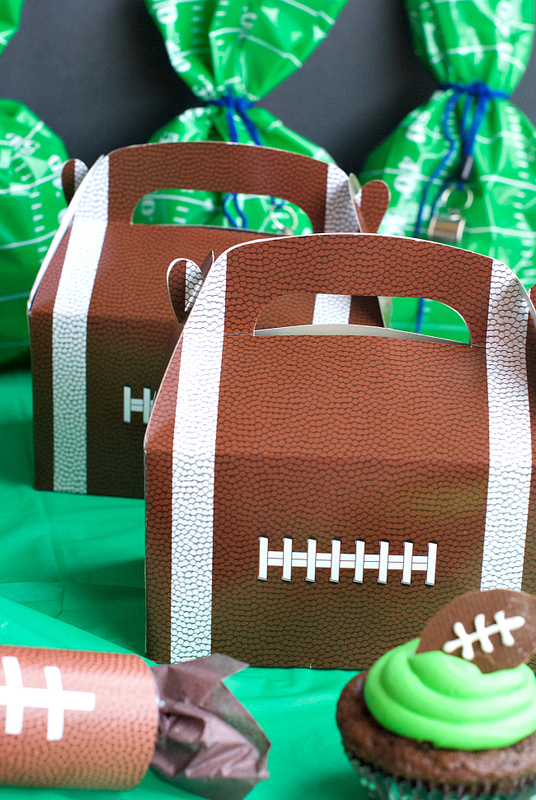 That’s a good look at all of our fun football party ideas. 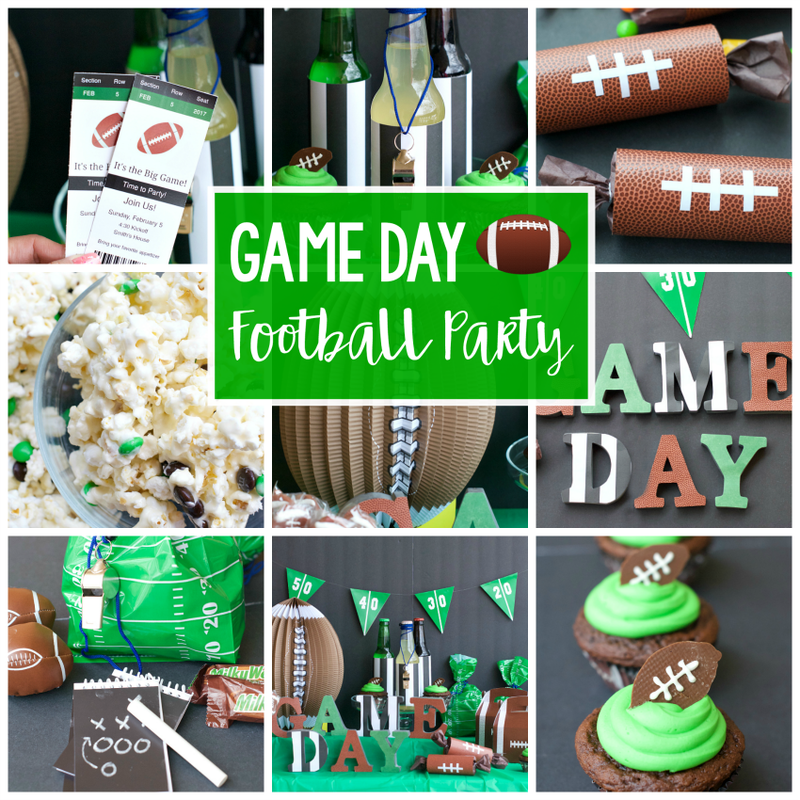 If you’re looking for more ideas that are perfect for hosting a football view party, check these fun football party ideas here. Have FUN throwing your football birthday party!